A primary goal of physics is to create mathematical models that allow both predictions and explanations of physical phenomena. We weave maths extensively into our physics instruction beginning in high school, and the level and complexity of the maths we draw on grows as our students progress through a physics curriculum. Despite much research on the learning of both physics and math, the problem of how to successfully teach most of our students to use maths in physics effectively remains unsolved. A fundamental issue is that in physics, we don’t just use maths, we think about the physical world with it. As a result, we make meaning with mathematical symbology in a different way than mathematicians do. In this talk we analyse how developing the competency of mathematical modelling is more than just “learning to do math” but requires learning to blend physical meaning into mathematical representations and use that physical meaning in solving problems. Examples are drawn from across the curriculum. The author gratefully acknowledges conversations and collaborations with the members of the NEXUS/Physics team and the University of Maryland’s Physics Education Research Group. This material is based upon work supported by the Howard Hughes Medical Institute and the US National Science Foundation under Awards No. DUE-12-39999 and DUE-15-04366. Any opinions, findings, and conclusions or recommendations expressed in this publication are those of the author and do not necessarily reflect the views of the National Science Foundation. Redish, E. F. (2005). 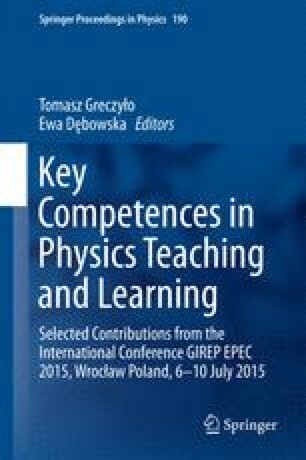 Problem solving and the use of math in physics courses, in Proceedings of the Conference, World View on Physics Education in 2005: Focusing on Change, Delhi. 21–26 Aug 2005. arXiv:physics/0608268 [physics.ed-ph].